A range of clear and amber borosilicate glass vials that are suitable for the storage of solvents, solutions, and samples. Polypropylene screw-top caps with PTFE-lined silicone septa are included, offering the highest level of protection when storing chemicals and aggressive solvents. Amber glass vials are perfect for storing samples that are sensitive to light exposure. Clear glass vials are great for testing the solubility or dispersability of materials, allowing you an unhindered view of the solution. 2ml vials: Perfect for the storage of solutions. With their open cap design, solution can be easily withdrawn for testing - without having to open the vial. 4ml vials: Perfect for commonly-used solutions (such as filtered PEDOT:PSS), or for the storage of small quantities of materials. Both 20ml and 40ml vials: Can be used for solution stocks, or for the decanting and transportation of small amounts of solvents. The storage of solvents, solutions, and samples often requires the use of chemically inert materials that can create a sealed environment to house them in. The use of glass vials with a tight-fitting impermeable septa offer the best method of storage of these materials. The correct septa type is crucial to preserving the original condition of your stored materials - so at Ossila, we only sell PTFE-lined silicone septas. The use of a PTFE lining offers the highest level of chemical compatibility of any lining material. Additionally, the use of silicone over other materials offers the lowest amount of swelling due to solvent vapours - which helps maintain the integrity of the PTFE lining. Our polypropylene caps are also resistant against solvent vapour, meaning that the cap lids will not be dissolved and end up being welded to the bottle. Our glass vials either come as clear glass or amber glass. For light-sensitive samples, we recommend the use of amber glass. 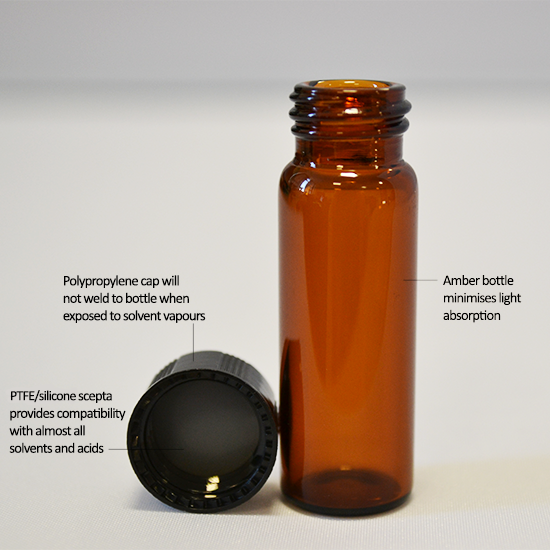 Materials stored in amber glass vials have are likely to have significantly increased shelf lives. This is due to the darkening of the glass which results in the absorption of higher-energy parts of the visible spectrum, which are often the cause of photochemical reactions. Our glass vials are available in packs of 100 and come with polypropylene caps and PTFE lined septas. What Solvents Are Compatible With These Vials? The main body of the vial is composed of borosilicate glass, which has a high chemical compatibility with most chemicals. The only chemicals that are not compatible with this areare hydrofluoric acid and concentrated hydroxide solutions. The septa within the cap assembly acts to seal the contents of the inside the vial, and is the only other part that will come in direct contact with the solution. PTFE has excellent compatibility with almost all materials with the exception of: diethyl amine, some alkali metals, fluorine, and other strong fluorinating agents. The silicone backing of the septa and the polypropylene cap should not come into direct contact with the stored material. However, when storing solvents, vapours may escape from the vial over time. As Ossila's vial caps are made of virgin grade polypropylene, the vapours from most common solvents will not cause the cap to dissolve. This stops the vial lids from welding to the glass when storing solvents for extended periods of time. What Wavelengths of Light Do the Amber Vials Block? Amber glass has an absorption edge at 500 nm, effectively blocking all blue and violet light. The absorption of amber glass continues into the infrared region of the spectra and becomes comparable with clear glass at around 1000 nm. This results in the most harmful parts of the visible spectra being completely absorbed, helping to increase the shelf life of your stored materials. How Can I Clean the Vials? Over time, dust and other particles may settle within your vials if they are not stored within a clean environment. To remove any residual dust particles that may have entered the vial or cap enclosure, we recommend using short blasts of compressed air to remove these particles.